The Ottawa 67’s and Sudbury Wolves are set to face off next in the second round of the 2019 OHL playoffs starting Friday night in Ottawa. Both teams swept their opponents 4-0 in the opening round, with Sudbury putting an end to the Mississauga Steelheads’ playoff run and the 67’s doing the same to the Hamilton Bulldogs. Sudbury finished the first round scoring a total of 17 goals and allowing eight. Star Finnish goalie Ukko-Pekka Luukkonen made 139 saves out of 147 shots in all four games. Luukkonen is going into the second round with a 0.946 SAV% and averaging 1.95 GAA. Drafted by the Buffalo Sabres in 2017, the Wolves’ goalie has been stellar all season and has carried that over into the playoffs. Sudbury finished in 4th place in the Eastern Conference and 7th overall in the league, one year removed from missing the post-season altogether. This time they managed to sweep their first playoff series since 2011. One of Sudbury’s star players is rookie Quinton Byfield who recorded two assists in Game 1 and scored two goals in Game 3, earning himself first star. Byfield sits in 6th place overall in playoff point standings with 7 points which follows had a busy rookie year in which he had 61 points in 64 games. Sudbury’s head coach, Cory Stillman is a notable NHL alumni, who played for teams such as Carolina, Ottawa, Calgary, Tampa Bay, St. Louis and Florida. This is Coach Stillman’s first stint in the playoffs with the Wolves. 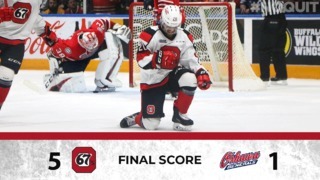 In the last five years, the 67’s are 6-2-0-1 against the Wolves. This season, the two teams have only met twice, each team getting an overtime win. 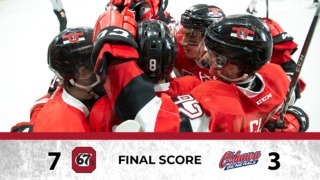 The 67’s had no problem taking down the Bulldogs at home or away. The team scored a total of 23 goals in the first round to make it to the second round for the first time since 2012. Sasha Chmelevski, the 67’s top scorer in the playoffs, sits two spots behind Sudbury’s Byfield on the playoffs points list. Chmelevski has 2 goals and 5 assists, scoring both goals in the opening game. While Chmelevski leads in points, right-winger Graeme Clarke leads in goals, scoring five. Cameron Tolnai played in his first career OHL game and scored his first OHL playoff goal which opened up the scoring in Game 4. Tolnai wasn’t the only rookie to score his first playoff goal, Marco Rossi and Merrick Rippon also netted their firsts. Michael DiPietro was solid in nets for the 67’s, only letting in eight goals in four games. DiPietro had a 0.916 SAV%, leading him to his first ever playoff series win. 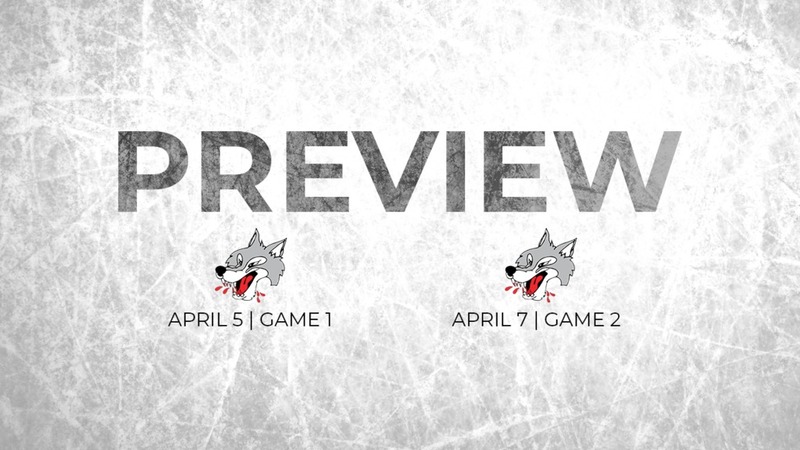 The Ottawa 67’s and the Sudbury Wolves will face off in their first game on Friday, April 5 at The Arena at TD Place. 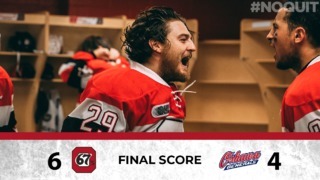 Game 1, Fri., April 5, Sudbury at Ottawa 7:00 p.m.
Game 2, Sun., April 7, Sudbury at Ottawa 2:00 p.m.
Game 3, Tues., April 9, Ottawa at Sudbury 7:05 p.m.
Game 4, Thurs., April 11, Ottawa at Sudbury 7:05 p.m.
For tickets to all upcoming playoff games, click here.